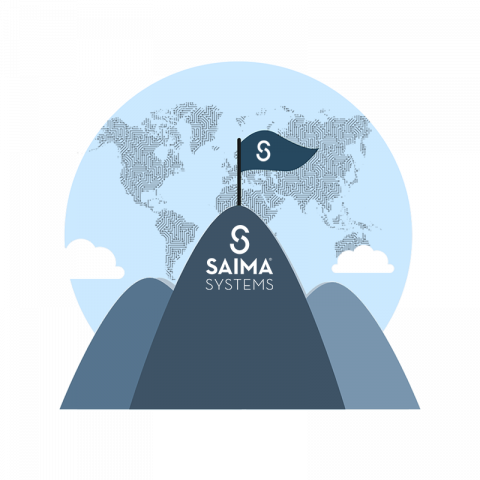 is the global platform for communication management, designed to unite all the branches of one company through public SD-WAN in a straightforward and secure manner. Moreover, has grown stronger as a global member of China Telecom, providing the definitive private SD-WAN solution so that branches of any company in Asia can communicate efficiently with the rest of the world. The agreement enables to provide stable and guaranteed connectivity to all those clients who have problems connecting their branches in China with the rest of the world. The word SD-WAN “Software defined WAN” means Software Defined Interconnected Networks. The function of SD-WAN is to improve and simplify the communications network management of companies. Giving companies resources so that they can efficiently manage their global communications network. Today, in the same way that Internet communication lines have advanced, with Fibre lines (FTTH) that enable companies to connect all their branches with very powerful connection speeds, SD-WAN technology is the best solution to be able to monitor these connections. With SD-WAN, companies can implement different communication lines and balance the load, do failover, define different traffic management criteria and/or carry out automatic backups using a tool via which they can control in real time how their WAN network is working and act efficiently should a problem arise in order to be able to solve it swiftly. Cloud Technologies have appeared very quickly and have had a very positive influence on SDWAN networks, helping them to grow exponentially. This will be the trend in the coming years, because companies want the control, they want to know how their networks are working: and the SD-WAN solution is much cheaper than any MPLS or Point-to-Point network managed by telecom providers. 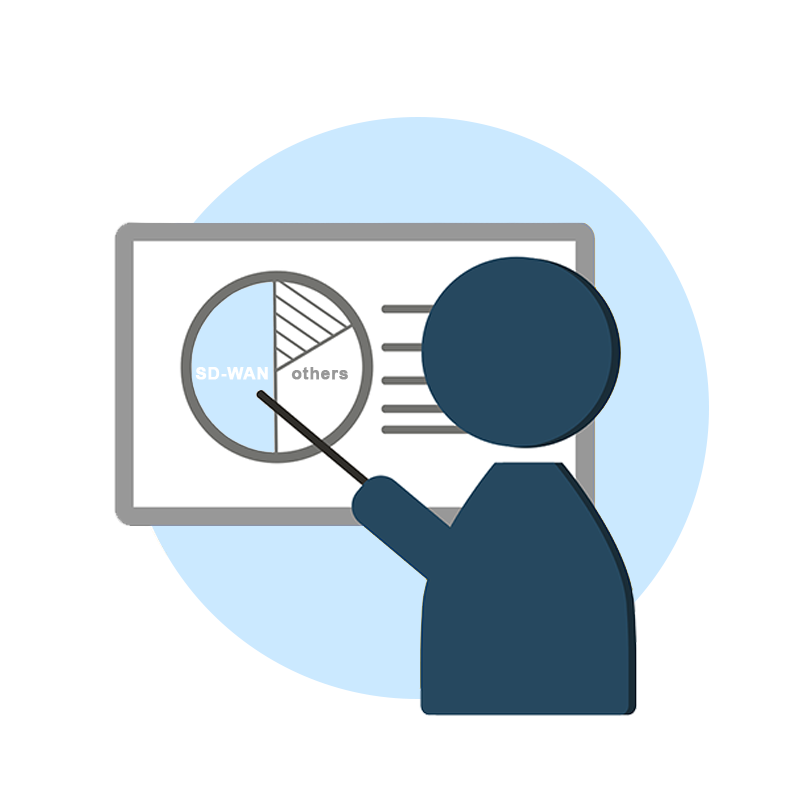 According to the GARTNER® study, SD-WAN has less than 15% market share, but it estimates that within two years, 40% of companies will be using SD-WAN. During the past year, the steady growth of this type of solution stands at 60% compared with the previous year. This is an upward trend, since several global reports indicate that this growth will continue to rise for the next ten years, as companies increasingly opt for this solution. This trend can be observed across the globe, and strong growth is predicted for this type of solution. is at the forefront of the sector and we are a fundamental partner for all those clients who want their global communications to be in line with the latest trend. Until recently, companies have worked with communication services such as Point-to-Point and MPLS, solutions which today are becoming outdated, giving way to SD-WAN solutions. Both communication lines and the Cloud have greatly improved their services, to such an extent that MPLS solutions are becoming obsolete compared to SD-WAN which provides full scalability in terms of management, load balancing and line capacity, among many other technical possibilities. At has 16 years of experience in Software Managed Networks and we help all our clients to improve their global communications network. 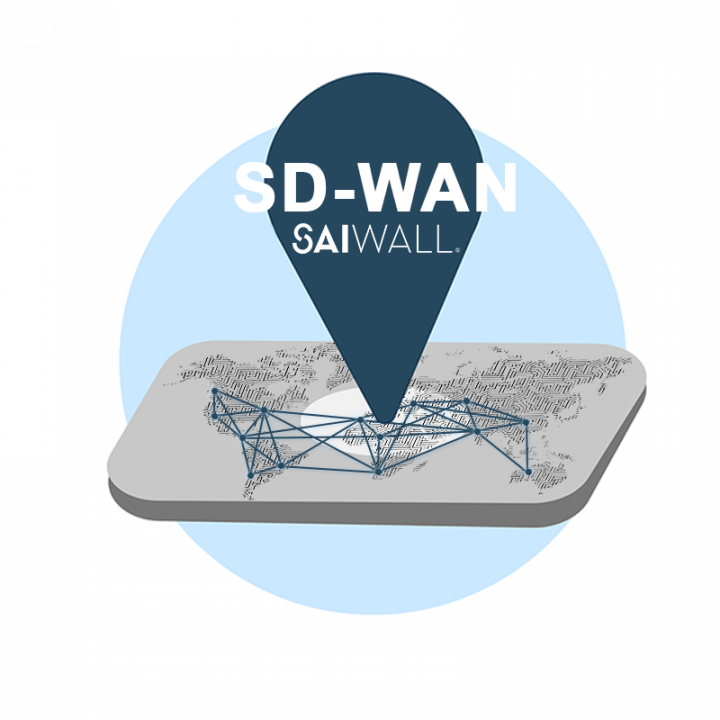 With SD-WAN we ensure our clients’ global communications operate smoothly while providing the most competitive market price. – On the one hand SD-WAN uses the Internet lines of different telecom providers to interconnect branches, and as such it works with faster speeds than an MPLS solution that depends on one provider and is more limited in terms of bandwidth. – Another important point is that SD-WAN does not depend on one provider. Different telecom providers with different lines can be used as well as load balancing, failover and automatic backup. In an MPLS solution, this option is not feasible since only one telecom provider is used to manage the client’s WAN network. – With SD-WAN, scalability is complete, connections are unlimited, it does not depend on an Internet line provider and it can be integrated with any environment the client may have. With MPLS it is completely different, since it depends fully on the infrastructure and management of one telecom provider, and as a result it is much more limited. – Another important point is the COST of the infrastructure used. 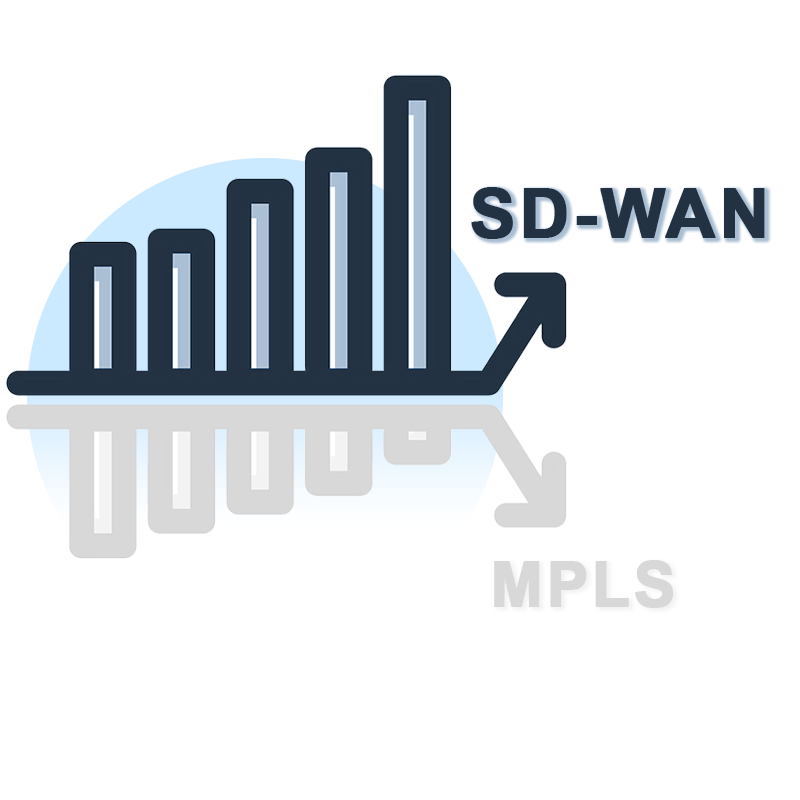 With SD-WAN, the cost is much lower than an MPLS solution because Internet lines are used, such as for example FTTH. Companies use very powerful Internet lines to be able to connect to the central services, wherever these may be, whether on the CLOUD, in an external data centre or in the headquarters of a company. With MPLS, specific lines are used, and as a result it is much more costly and harder to control. For these reasons, and others, SD-WAN technology has come to stay and in the next few years, it will spread across the globe. 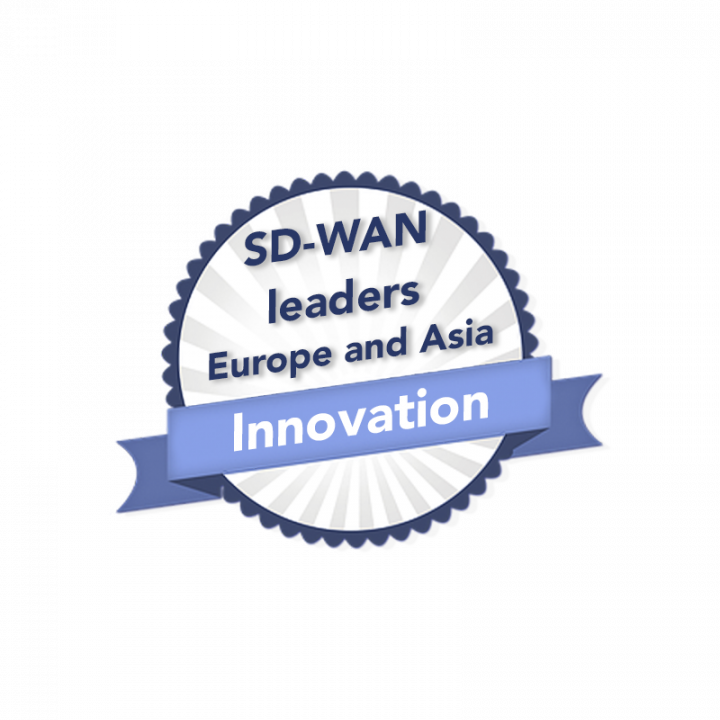 According to the GARTNER® study, SD-WAN has less than 15% market share, but it estimates that within two years, 40% of companies will be using SD-WAN.